Most food we serve at Café Masonis homemade, prepared from the scratch using quality ingredients. Distinguished from serving more of ready-made-food in many diners, presenting homemade food takes more labor and time. We are charging same price as neighboring diners, profits are less but we take a great pride of serving good food. We carefully select our own produce daily, mostly organic produce whenever available. All herbs are fresh from farm to table, we do not use dried, preserved herbs for any dish. 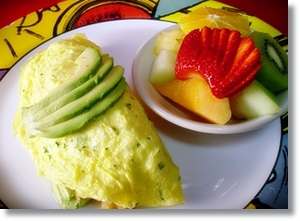 For Breakfast, we are quite proud of offering many fine dishes that are healthy and yet tasteful. 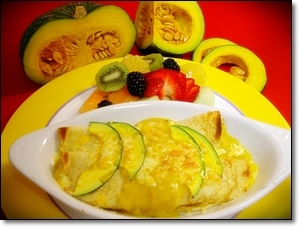 Most of the Crepes, Benedicts, and Frittattas are made with our own receipe with the concern of good food for better health. We actually squeeze orange juice at the premise, unlike other restaurants serving fresh squeezed juice(?) that is delivered by vendors with preservatives in it. For home-fries we use the Yukon potatoes, and real butter is used while pan-and-grill oil(cheap, but the ingredient in it is rather uncomfortable to offer to our own children) is used on most restaurants. Fruit or baked tomato is also offered in place of home-fries without an extra charge. Our own brand of Mason coffee (with the strict standard of our choice of quality coffee beans) is freshly roasted and delivered immediately after roasting by a local coffee roaster , Sunrise coffee co.
For Lunch and dinner, we are proud to offer many selections of top notch quality pastas in a bargain price. All pastas are freshly made and delivered daily by a local pasta maker, La Spiga De Oro company (we used to make our own pasta, but we have discovered La spiga de oro makes better pastas than us). All pastas are cooked to order and prepared individually, with fresh herbs and olive oil. Although missing fancifully dripped sauces on plates for presentation, nor placed food on top of rice, exceptionally excellent choices of lunch and dinner entrees are offered with a good price. Try our famous Mason portobella mushroom cheese burger.